Well, not exactly. I’m not sure an exceptionally convoluted frontal lobe will ever get as many facebook friends as a ruggedly carved six-pack, based on pure looks. At least for me. Because of course, since I’m a returning student with no transfer credits in the CCSF system yet, I’m on the bottom rung of the ladder when it comes to registering and adding into classes this semester. Never mind that historically I have abhorred math, that I really don’t appreciate being made to beg for anything, that I don’t like rules and policies that get in my way, and that I think it’s especially ironic that I have to practically plead to take a grueling one-hour-5-day-a-week class … I was willing to do just about anything to get into this joint. The situation goes like this. As a student seeking to transfer to SF State as a Business major, I need to complete several courses of study. One is in mathematics. Mine involves MATH 860 followed by Business Math and Probability & Statistics. Not to mention two semesters of accounting classes. So, to avoid having to pile math on top of math on top of accounting for one hellish semester in the future, I was eager to get MATH 860 out of the way now. Easin’ on down that road to mathiness. But no dice, brother! That was everyone else’s plan too. I don’t want to draw this out too long for you, my patient reader, but I do want to show you how tough it has been…especially for someone who doesn’t handle uncertainty — or being told “no” — very well. I showed up to a possible class at 10am on Day One….and could not even get in the door. 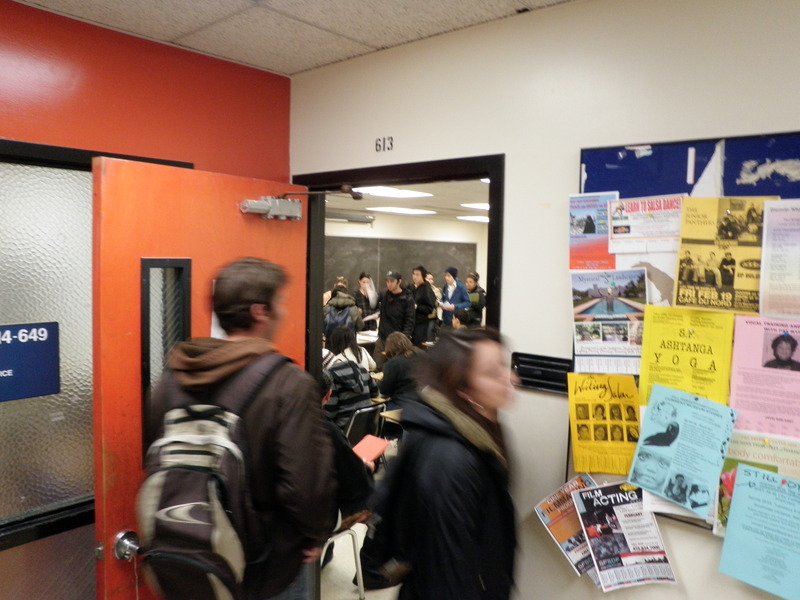 There was a sea of students trying to get in the classroom, which was already full. We all just stood around like cattle. Confused. Bumping into one another. Aimlessly milling about. Desiring math instructing. Please. Teach me math. Someone, ANYONE! I went to another possible class at 1pm. In this one I managed to snag a seat! But of course we had to put our names on a list and wait to be added the second day — pending proof of registration date. Ugh. So I go back to this class the following day with my fingers crossed. After sitting through an hour of instruction the day before, mind you. It looks rather quiet, there aren’t people standing this time. Attendance is taken……several registered students aren’t there for the second day, meaning they are dropped!! More room for me! The instructor begins working his way through the wait list, going by… you guessed it! Registration date! And of course I am at the bottom of that list. So, I resolve to attempt a THIRD class, an undesirable, unsavory night class. I get there early and there is a line of students filing in the room and immediately exiting again with a form to fill out because they, too, are trying to add. I say, “F— it,” snap a photo of the situation for you guys to laugh at, and roll straight home. So the next day, I hear through the grapevine that they have added another section of 860 at 2pm!!! I go to the Dean of Mathematics to confirm the rumor. On the door of the Dean of Mathematics is a letter basically saying basically, “Sorry, we don’t have enough math classes for everybody this semester. Looks like you’re S.O.L., bro.” Not looking good. I race over. The classroom is again, packed to the gills. Word travels fast, I guess. The instructor tells us he is sorry to say that he only has 20 slots available and they must be held open until the next week (so that International Students can take their time adding, I assume) and that he can add people then. And this just in, there are only 18 spots left. Others will be added based on ………. registration date. I got up and walked out. Naturally. I mean come on, what, I’m going to sit in this class every day for a week only to have my registration date eliminate me? When I could go ahead and add into another class for sure? I’m meeting with my advisor soon to ask if she thinks I’m too screwed in the Math department. Meanwhile, I’m bracing for the same situation next fall, but counting on an earlier registration date to get me into a class. Of course I could take the class during the summer but, that’s a wee bit hard to do when the school has axed the summer session due to funding! And that, my dears, is the state of higher education today. At least community college higher education in California. You face a lot of competition to get what you need to succeed, because the State can’t currently afford to provide enough vital services to students. And if you’re new, even fighting is not going to get you anywhere!